Living in California, I always have oranges or tangerines in the house. But I need to make room for grapefruit. Most of us know citrus (in season now) is loaded with immunity-boosting vitamin C. Grapefruit is a good choice, and it’s a winner on the anti-aging front too. Could This Chocolate Cake Help Your Hot Flashes? Slows cell aging. Grapefruit contains large quantities of spermidine—which, as the name suggests, is also plentiful in, well, um, human sperm. The compound helps cells grow and mature, and in 2009, researchers in Austria found that when they added spermidine to the diets of mice, it both increased the life span of cells and slowed cell aging in the mice. Spermidine has also been found to slow aging in human immune cells by inducing autophagy—a process that helps our cells regenerate. Squelches harmful free radicals. The brilliant pink pigment in some grapefruit indicates the presence of lycopene, an antioxidant that combats the body’s cell aging triggered by harmful free radicals. Lycopene may also help lower your risk of several kinds of cancer, including prostate, colon and lung. Keeps your heart healthy. Grapefruit is a good source of fiber, including the soluble fiber that removes cholesterol during digestion. By preventing cholesterol from entering your bloodstream, soluble fiber helps lower the risk of age-related conditions like cardiovascular disease and high blood pressure. AntioxiDON’T:Pair with some medications. One of the compounds in grapefruit binds to enzymes naturally found in your intestines that help reduce the absorption of some medications, including statins, anti-depressants and calcium blockers. When those enzymes are blocked, these medications are more easily absorbed, causing blood levels of these medications to rise faster and higher than normal, which can be dangerous. If you’re taking these medications, check with your doctor about including grapefruit in your diet. Chances are it’s all right so long as you’re consistent with how often and how much you eat grapefruit. 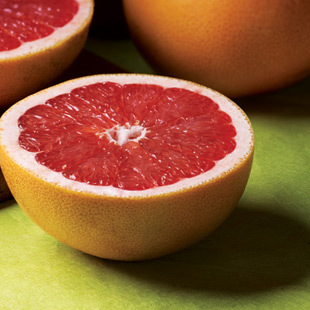 Must-Read:Should You Opt for Organic Grapefruit? Recipereprinted with permission from “Positively Ageless: A 28-Day Plan for a Younger, Slimmer, Sexier You” by Cheryl Forberg, R.D. (Rodale). Lassi (or lhassi) is an Indian yogurt drink. A savory lassi may be flavored with spices such as cumin, and may even contain salt. This sweet lassi is made with antioxidant-rich pink grapefruit juice. Creamy Greek-style yogurt is high in protein, making this frosty treat a perfect on-the-go breakfast or a welcome refresher after a great workout. Combine all ingredients in blender jar. Blend until smooth. Add sweetener, if desired. Garnish with fresh mint sprig. How do you include grapefruit in your diet? Cheryl Forberg, R.D., is a James Beard Award-winning author, the nutritionist for NBC's The Biggest Loser and author of Positively Ageless: A 28-Day Plan for a Younger, Slimmer, Sexier You (Rodale, 2008).